Jews first arrived in Camden in the 1840s, and the town already had a significant population by the time of the Civil War. Yet it took Camden Jews several years before they began to create Jewish institutions. Like Jews in many other towns, the first communal organization Camden Jews founded was a burial society. The Camden Hebrew Benevolent Society was incorporated in 1865. By 1870, the Camden Hebrew Benevolent Society had purchased land for a cemetery. Before a congregation was officially chartered, Camden Jews prayed together as local merchant Aaron Freidheim led services and taught a Sunday school for their children. 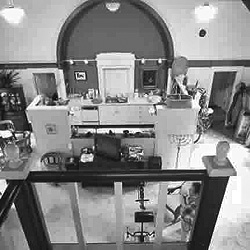 In December of 1870, a group of 24 Jews in Camden officially founded a congregation, Beth El Emeth (House of God of Truth). Its first officers were: Solomon Block, president; John Lazarus, secretary; Moses Winter, treasurer; and Edward Feibelman, Sol Levy, and David Felsenthal, trustees. All but three of these 24 founders were immigrants; most were from the German states and owned retail stores. Indeed, a handful of these founders were very successful businessmen, and used their significant financial means to support the fledgling congregation. At their founding meeting, members discussed their hope to build a synagogue. In 1872, the group broke ground on a temple at the corner of Adams Avenue and Jackson Street. To go along with their new building, the small congregation was able to hire a full-time rabbi in August of 1872, Rabbi M. Sukenheimer from Chicago. Rabbi Sukenheimer presided over the formal dedication of the synagogue in October of 1873, an event which attracted both Jews and Gentiles. During the ceremony, Sukenheimer spoke about the importance of religious liberty and toleration in America, contrasting it with the repression that Jews had long experienced throughout the world. The synagogue was a tall frame building with a brick foundation and a high ceiling. Winding stairs from each corner of the front entrance led into the main sanctuary, which could seat 150 people. On the lower floor was a meeting room used for Sunday School that was added in 1887. According to member Adolph Felsenthal, “in design, it was crude perhaps, but with a simple austerity of plan that reflects the sober minded character of the men who first provided it.” The building cost the congregation $8000, which they paid in full with no debt by the time of the dedication. This was a remarkable feat for a congregation that had only 15 member families at the time. This was testament to the tremendous economic success many of these Jewish merchants had achieved in Camden. When Rabbi Sukenheimer left two years later, Beth El Emeth was able to fill the pulpit with a series of rabbis who stayed for short terms. Perhaps the most notable one was Nachman Benson, who was very popular with Jews and gentiles in town when he served the congregation from 1877 to 1878. In addition to leading weekly services, Benson also ran a day school at the temple since there was no public school system in town at the time. He taught secular subjects during the week, and religious topics during Sunday School. Rabbi Benson was a very charismatic speaker, and his Friday night sermons attracted many area gentiles to the temple. Benson left Camden to serve a congregation in Macon, Georgia, and later returned to Arkansas to lead B’nai Israel in Little Rock. Although most all of the founders had been raised Orthodox, Beth El Emeth was founded as a Reform congregation. They soon joined the Union of American Hebrew Congregations, the central organization of Reform Judaism in the US. As merchants, congregation members were unable to close their stores on Saturday, the biggest business day of the week, and thus had to adjust their religious practice to fit their new environment. By the 20th century, Beth El Emeth was in decline. Between 1902 and 1912, the membership never fluctuated from 13 members. In 1913, it dropped to 11 members. They found it harder to attract and support a full-time rabbi. Rabbi Max Rosenstein led the congregation from 1910 to 1911, but more often than not, the congregation did not have a rabbi. By 1919, they had dispensed with weekly Shabbat services, meeting only on the Jewish holidays. 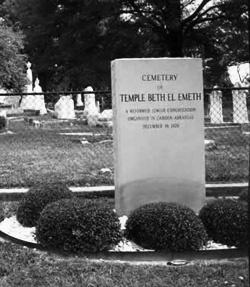 Beth El Emeth often relied on student rabbis from Hebrew Union College in Cincinnati. One notable student rabbi was Samuel Goldenson, who went on to become a renowned rabbi, serving one of the largest Reform temples in New York. Goldenson’s short tenure in Camden was memorable as he met his future wife, Claudia Myar, while staying with her family during one of his visits to town. In 1927, with no sign of a future increase in membership, the members of Beth El Emeth decided to sell their building. They took one-third of the sale’s proceeds and created a perpetual care fund for their cemetery. Clearly, the remaining members did not expect the congregation to last much longer. In the late 1930s, inspired by a new statewide organization of Arkansas Jews, Henry Berg built a small synagogue on Clifton Street to try to revitalize the congregation. But the congregation remained small and the synagogue was rarely used. 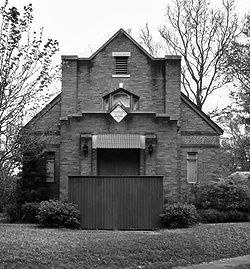 Eventually, the congregation disbanded and the synagogue was sold and made into a private home; money from the sale went into the cemetery fund. In 1989, the cemetery fund, controlled by Jews from Camden who now lived in other cities, donated $1000 to the local United Way in Camden as a commemoration of the early Jewish settlers in town. By the mid 1990s, there was only Jewish family remaining in town. Since there was no longer a congregation in Camden, they drove to Little Rock for religious school and worship services. Beth El Emeth was never large; but for several decades in the late 19th century, it was a strong congregation with a significant synagogue and a full-time rabbi. As Camden’s economic role in the cotton trade declined, so did its Jewish community.